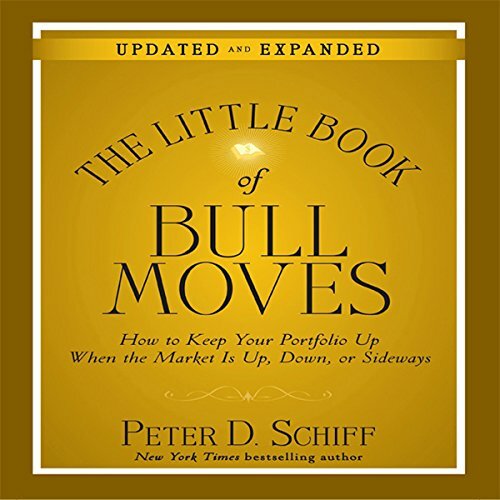 Filled with the sort of insightful commentary, inventive metaphors, and prescriptive advice readers have come to expect from Schiff, The Little Book of Bull Moves shows you commonsense ways to successfully implement various bull moves so that you can preserve, and even grow, your wealth in an economy experiencing high inflation, collapsed markets, and rising interest rates coupled with declining currencies. For investors who understand that the worst is yet to come, but don’t know what to do about it, and for those for whom a new economic and financial anxiety has taken hold, The Little Book of Bull Moves offers timely insights into using a conservative, nontraditional investment strategy to protect your portfolio and even profit during these uncertain economic times and those to come. I had little knowledge of most of Schiff's material going in, yet he made it accessible with very little back-listening needed on my part. Sean Pratt really helped in this regard, clearly and appropriately pronouncing, giving enough "empty space" for my brain to process, for example when reading a list of subjects or terms. I got the impression Pratt already understood what he was reading, which did in turn helped me to understand. As for Schiff, the content is completely original, to me at least, leaving loads of things to stew over. I also like the 2010 update (since 2008's first edition) after each section. This is a great book and a great ebook! I burned it into 6 CD's. Its better to get and IPOD and connect it to your car stereo. Overall, the experience listening to this information was incredible. This is my first audible book I listened in my car over several days. The audio book was crystal clear and I love going back to listen things I missed. Peter discussed topics that are well balanced. However this book is geared more for people with deep pockets that can trade or invest with or without a broker. The book targets stock investors as he states. But it is for anyone who wants to know what is going on with the economy in general. Peter's predictions were on target with fiscal spending and other variables but lacks the precise timing as that is difficult to accomplish. However, I learned so much and heard this while driving and there is no better way than to learn while you are driving. Why read when you can listen. Peters audio book was not overly technical and I especially loved one particular chapter when he discussed and goes through all the countries one should investigate and invest in. The part I liked the least was on his advise on how to live in another country if the US economy gets in really bad shape. This seems to be a trend among rich analyst and financial guru's. I wish he could've devoted more time on what people can do without leaving the country other than relocating out of highly dense cities. Most American families will not be able to leave the country and is thus ex-patriotic in a sense. But if you have lots of cash like these guys, well it's not a problem at all is it? Finally, this audio book is great and I recommend it to anyone who wants to know the solid truth about our economy and the dangerous hyperinflation ahead, if Ben Bernanke continues with QE after 2010!! This book provides insights and perspectives so eye opening it is hard to stop listening. The insights themselves are what you would hope to get from sitting down for several hours to get direct advice from an industry professional. Great message, still useful today in 2016. More focused on the 2008/2010 context than bull markets in general. Easy listen, and some nice detail on commodity investing internationally.